Just when I thought I have all the spindles I need, I fell for a supported spindle that looked like it wanted to be spun by me. 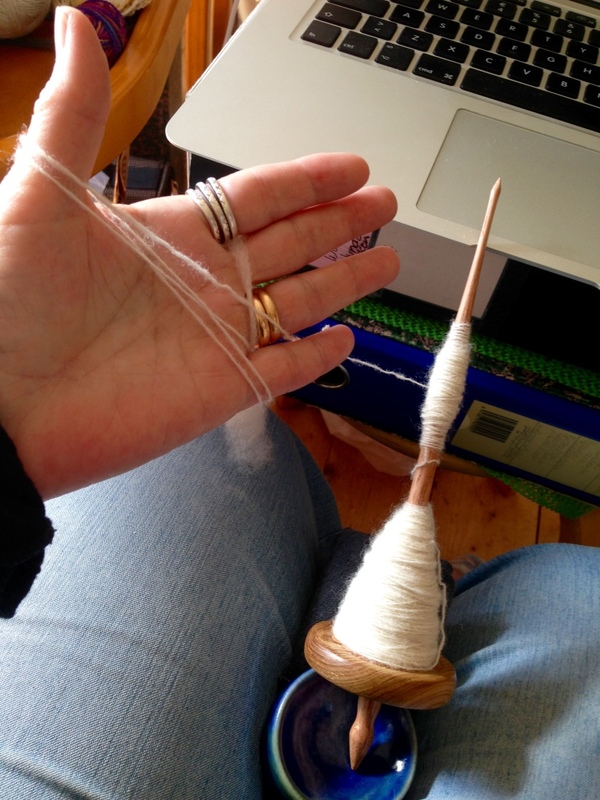 I had been looking for a spindle like that after having seen one quite similar in a Swedish spinning group on Facebook. Sturdy, robust, ordinary wood, no bling bling, just a tool made with care for the performance. So I bought it. It’s the one on the left. I was quite surprised when I opened the package and found not only one spindle, but two. The maker had sent me a demo spindle as an extra bonus. It’s a top whorl with a kind of whorl I didn’t have earlier. Both spindles are short. The top whorl is 8″, the supported 9 1/2″. They weigh 27 and 25 grams, which is what I like in spindles I use for fine to medium wools. The woods are new to me: cypress and red oak in the supported, yellow box and red/white iron bark in the top whorl, all from Australia. So how do they spin? They are – perfect. I have many good spindles from renowned makers. I like them all. But there are spindles I return to over and over again. My bossies. The Maggie spindle, also quite new, but immediately a favourite. My IST Russian spindles. Michael Williams top whorl. Jenkins Kuchulu. My light weight Comets from Wooly Designs. 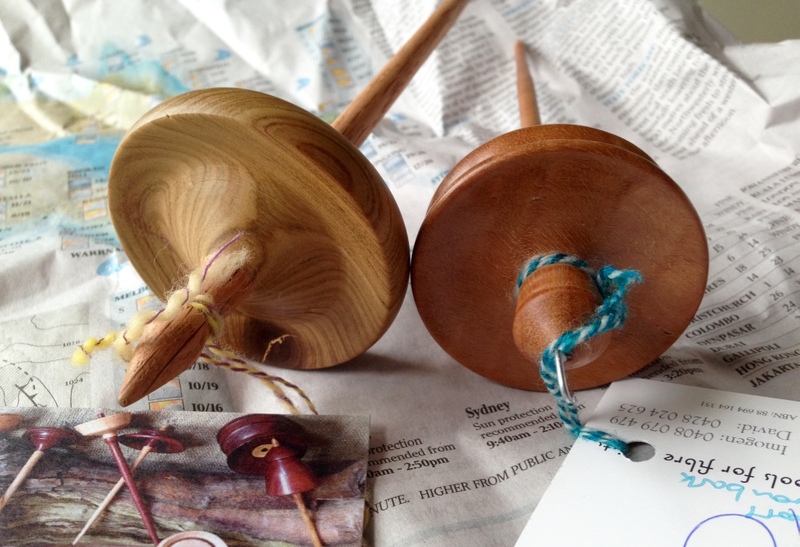 Two light weight square top whorl spindles from Spindlewood. A home made doughnut supported spindle. And a few more. But this little supported spindle is amazing. The length is perfect for me. I sit down in my armchair when I spin, so long spindles are a bit uncomfortable even if I keep the bowl beside me instead of in my lap. I still have to spin more on the top whorl, but I can already see I like it. If it’ll become a favourite I’ll know later. Right now I’m so fond of the supported little tornado that I don’t want to spin on anything else. David Johnson from LuxuryOverdose made those two lovely tools. One of the things that make me happy about spindles is, that you very often know who made them. Turning spindles is not easy. 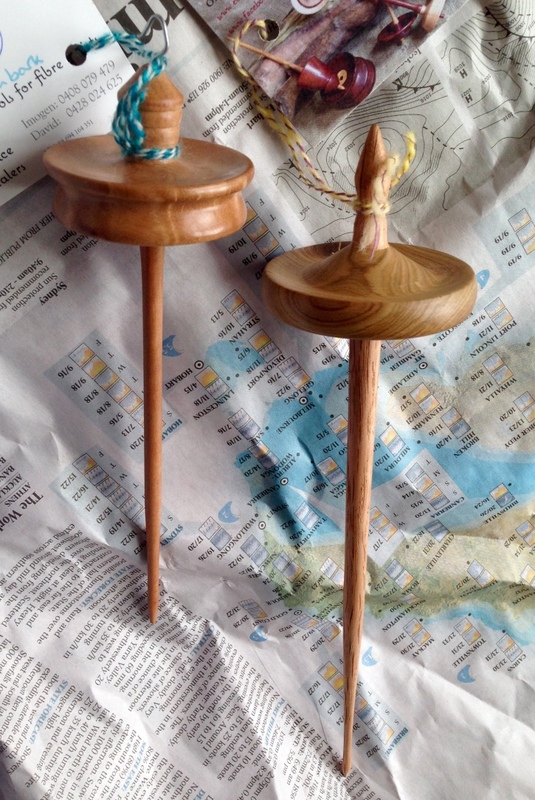 It takes time, practise, and a deep interest to learn how to make a good spindle. I can feel the fine craftsmanship when I hold a good spindle in my hand, and sometimes I can see it in a photo without even trying it first. You can see the good craftsmanship in the wood, the grain, the form, the finish, the balance, the proportions. Spinning short hand carded Finnsheep. Making a butterfly so I can rewind the temporary cop to the final cop. The bowl is from IST Woodemporium. These spindles look very well made with extra weight on the outside edge of the whorl, which makes for smoother spinning. I like the looks of the smaller whorl spindle best. But sounds like they are both very functional spindles. Spinners don’t know what they are missing if they do not spindle spin and there are plenty of spinners who say they do not like it. I think it brings the basics of spinning right into your hands. It can be slower but rewarding also. Thanks for sharing. Gorgeous tools! I love playing with new spindles. I am the lucky owner of a darker twin to your spindle. I haven’t given it the time it deserves yet, but it is a gem. Agree that the short shaft is practical and the no fuss design means it is meant for spinning well, not for just looking good. Ah, that’s nice! I know a spinner in northern Sweden who has one also. So maybe triplets? I’m in the market for a supported spindle on this side of the Pond. I’ve seen the Spindolyn in action and it looks quite nice but both of yours do too!! A tidy little collection of spindles sounds like a good idea. LuxuryOverdose have developed a tool that slightly resembles Spindolyn: a “Support Companion”. There’s a video on their FB page. Good luck with purchasing a “tidy collection” of spindles! Yes Susan, you’ve drawn the right conclusion: you need more spindles!